This is a guest post by Brad Leclerc. Brad is a writer for Cogniview, the leading producer of PDF to excel conversion tools. 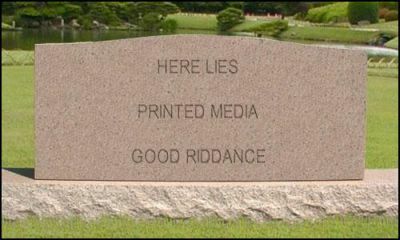 Question: Is printed media (newspapers, magazines) dead? Of course that doesn’t really explain anything. So let’s dig in a bit and I’ll show you why I say that. You may have noticed that there has been a lot of news recently about several newspapers and other publications going under like Denver’s “Rocky Mountain News” or going “web-only”, as the Seattle Post Intelligencer is gearing up for. There are a lot of reasons for this sort of collapse of printed media starting to hit major publications, not the least of which is the current state of the economy, but one of the major factors seems to be that more and more people are getting their news online. That movement is leading to a lot less revenue for printed media due to fewer sales in general and secondarily through loss of advertising because of the lower sales. It’s a pretty vicious cycle to be caught in, especially since the cost of publication doesn’t really scale down as the sales do, so they are spending the same (or more in some cases) and making a lot less. Sooner or later something is bound to snap, and that’s what we are seeing now. The silver lining, as I see it at least, is that it’s not necessarily bad for those businesses to move away from traditional printing and into the digital world. It’s MASSIVELY cheaper to manage and distribute (no printing costs, no delivery costs, etc), the costs of maintaining it scale proportionally to the profits, and the cost of producing the content is at worst the same (they would still need journalists, writers, editors, etc), but likely could reduce costs in other areas, such as smaller offices, as much of the equipment (printing presses, etc) is no longer needed. The one thing people in the traditional media seem to be worried about is the quality of the online content, but that quality doesn’t come from nowhere, it comes from whoever is creating it. If (really “when”, since it is already happening and will continue to do so) journalists and other writers for major publications move into the online world the quality of their work won’t go down. The current state of blogs and online content does not typically compare to traditional media standards…yet. Though there are exceptions. That is, however, quickly changing for the better as more great writers move to blogs and online publications as the readers (and profits) shift to online publications. There’s no reason why a free press can’t be evident online instead of in print newspapers and magazines, but one thing a free-press needs is people actually ferreting out the news! Reporters and editors! On the payroll! Full-time, preferably! A democracy cannot thrive by blog alone! Can it? Thankfully, the answer to that question is also an emphatic “Yes it can.” Blogs and other online publications are cheaper to maintain, much more flexible (especially in regards to updating stories as they unfold), and they can be far more targeted to a specific audience, raising reader loyalty (and thus also ad sales and other profitable ventures). With the rise of things like Amazon’s Kindle, it’s easy to see where the world of publishing is headed. There will be no room for printed (and thus static) publications, when anyone who wants to can get up to the second updates on their favourite news site. Why bother going out to the local news stand, or paying for a printed copy of a newspaper, when it can be delivered faster and cheaper to your email or a device like the Kindle? It simply makes no sense to maintain a paper version of a newspaper or magazine from a financial standpoint, so there’s really no chance for them to survive for much longer. It’s been estimated that the New York Times costs about twice as much per year to maintain then it would cost them to send every single one of the their subscribers a new Kindle(source). There is no avoiding a collapse of that kind of business model. Once the technology really catches up to the needs and desires of the mass public, which is coming VERY quickly, there is no saving printed media…and that’s a good thing for everyone involved. This entry was posted in Rant on March 8, 2009 by Admin. This is not a new story or suprise for the newspaper publisher. The industry will never be the same and I believe we will see even more household name brand publications go away by 2010. What I don’t see, is the presses ever stopping completely. While it is easy to see what effect the net and new media has had on all traditional media, there is no really effective way to deliver time sensitive ads to a large “local” group” through online deliver. If an idea comes along that can change this fact, then that would be the ultimate end. My opinion though is that the newspaper industry is forever changed, but models do exist that will be supported by both advertiser and news consumer. I definitely see local papers and publications aiming at very targeted audiences surviving longer than the national papers and such, for exactly the reasons you mention. There is just no effective way to replace the “local” aspect of a paper in digital form…yet. Though there are projects in the work that might eventually do it, it’s still far off. The big guys though, are just flat-out doomed, since they are so easily replaced by a digital version. I doubt that paper media will die completely (not for a long long time at least), but things are changing very quickly, and those that don’t start adapting now are in serious trouble in the next few years. Another reason for decline in sales, at least in part, is due to the what is being published in these newspapers. Many publishers use the paper to promote thier extreme left wing agenda. The believe thier readers are to stupid to know that what is being published in not news but left wing propaganda. Thier readers are not as dumb as they think they are. Read this article by John C. Dvorak, “Newspaper Publishers Are Idiots”, for his ideas on what is ailing our newspapers and what they can do to fix it. True, a lot of what is printed (in Newspapers especially, but other places too) is pretty skewed, though it’s hardly a “left wing” issue, and far more a “crazy bastards” issue which ranges the whole political spectrum depending on the specific publication. More or less, a part of me agrees and a part disagrees. True enough, the world wide web almost has everything, just a click or type away that at times you can think that printed media doesn’t stand a chance anymore. However, printed media also has some aspects that the world wide web cannot duplicate and that is the knowledge that is always so detailed in books, or the crisp of the morning paper. Although the flame of printed media is somewhat dying, it will not totally flicker out for me since some would still be publishing books, newspapers, etc.